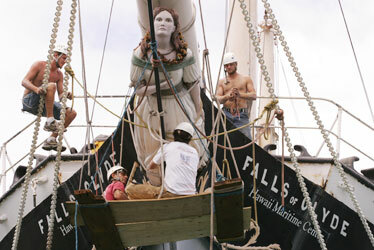 John Koon, left, and Matthew Caplins loosen the figurehead from the Falls of Clyde's bow in Honolulu Harbor. The fate of a historic freighter could lie in the hands of a potential benefactor from Australia. Bishop Museum officials said a plan to preserve and restore the ship needs to be formalized by Sept. 1 or the Falls of Clyde will be scuttled. The 130-year-old vessel was to be sunk today until a man from Australia expressed interest in restoring the ship. Though the man had recently sent a detailed plan to Bishop Museum that involves a floating dry dock in California and restoration work to be done in Australia, an agreement has yet to be signed. Discussions between the potential benefactor and museum officials have hit a lull in the last couple of days. “We’re not sure where he stands at this point,” said Timothy Johns, president and chief executive officer of Bishop Museum. Two local groups also expressed interest in preserving the ship, but plans are still in the works. Chris Woolaway, a member of one group, called the Friends of the Falls of Clyde, said they are continuing to look for in-kind support and a nonprofit organization. “There is a short time left,” Woolaway said. Meanwhile, Bishop Museum has obtained conditional approval from the federal Environmental Protection Agency to scuttle the ship sometime between Sept. 8 and 15. The ship is due to be sunk 12 miles south-southwest of Honolulu Harbor at a depth of 1,800 feet. Memorabilia that include the ship’s wheel, skylight, compass, bell and figurehead have since been removed from the vessel and stored at the Hawaii Maritime Center. Hundreds of letters were sent to interested parties and those within the maritime industry by the museum earlier this year in its search for a potential benefactor. Officials said it would cost more than $32 million to restore the ship. The museum lacks the funding. The ship, the only fully rigged four-masted vessel in the world, was closed to the public in January 2007. The vessel was used initially in trans-Pacific passenger travel and freight transportation. Blair Collis, the museum’s senior vice president and chief operating officer, said the ship could very well sink at its current spot, Honolulu Harbor’s Pier 7, should a bad storm strike. Contractors have stabilized the ship in the last couple of months for towing. The ship is not insurable, officials said, adding that relocation is necessary. “It needs to get out of Honolulu Harbor in its current condition, no matter what,” said Johns.